Firefly American Bistro & Bar is a casually upscale American bistro situated in the heart of Manchester's downtown district. Firefly embraces the concept of comfort dining by offering inspired classic American fare in a warm, inviting atmosphere. 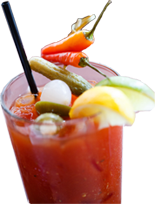 Build your own bloody mary! Monday - Thursday 4 - 6:30 & 9 - close.